Say g’day to Australiana, a new range by Albi, filled with tonnes of fun accessories and gifts! Australiana is a vehicle to showcase some of Australia’s favourite local artists. It’s their creative imagination and breathtaking talent that allows us to witness the beauty of Australia emerge through exquisite art…or even your basic household items. Want to know the perfect way you can bring some colour and vibrance into your kitchen? 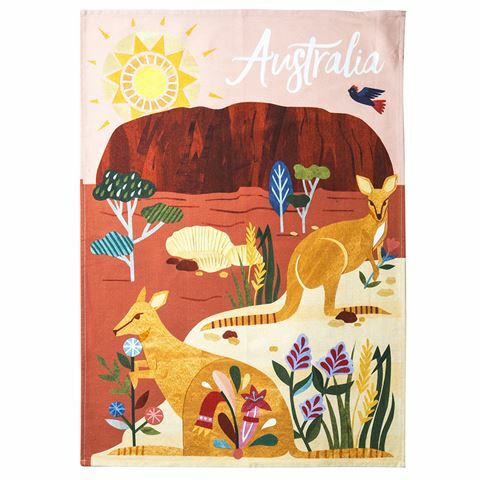 Well, thanks to the Outback Tea Towel by Australiana, not only will your kitchen resemble one of beauty, but also of grace. This beautiful tea towel, has been designed by Andrea Smith, an artist and illustrator who depicts unique Australian emblems from the landscape to represent her artwork. Illustrated and designed by Andrea Smith. Elegant and vibrant colours of Australian related fauna and flora. Perfect way to dry your dishes. Great way to bring some style and colour into your kitchen. Dimensions: 50cm (w) x 70cm (l).